EXPLORE SCIENCE! 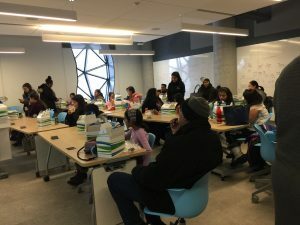 is a FREE fun-filled day for girls from K – Grade 12 to interact with hands-on activities in chemistry, physics, biology, computer science, geology, and more! Come and EXPLORE what it’s like to be a scientist for a day with over 20 exciting activities—extract DNA from strawberries, find finger prints as a Crime Scene Investigator, and make crystals disappear, visit labs and get hands-on experience with 3-D Printing, Laser cutting and robotics, win prizes by solving Science puzzles and take goodies back home. Our Mission: Our mission through Explore Science is to encourage girls in STEM fields by showcasing different fields of STEM and their real-life examples. We want to open doors of zillions of opportunities for girls to explore for their future. The event is accessible by transit.